The Amateur Poker Association &amp; Tour (APAT) held the third event of its second season, the Welsh Amateur Poker Championship in Cardiff's Grosvenor Casino, on 12th-13th January. The event had 190 entries plus alternates, who qualified by high finishes in the last round of APAT Regional Events, online satellites and direct payment and I was one of the qualifiers. 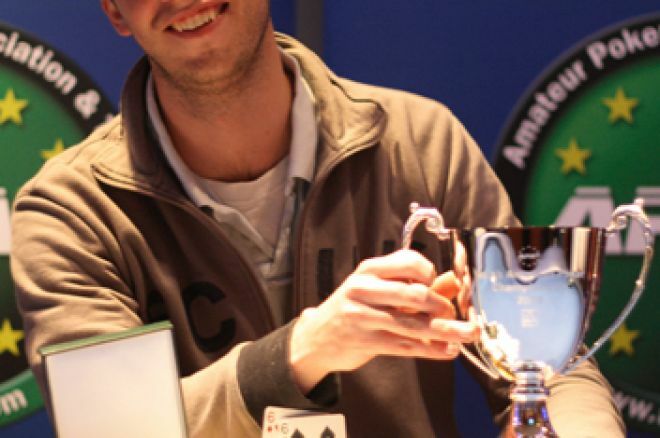 Players were once again offered a £75 freeze-out with 10,000 starting chips, a 40 min clock, £3,350 to the winner plus significant added value from new tour sponsors BlueSquare.com via the form of an entry package into a GUKPT event in 2008 in London worth $3,000 to the winner in addition to their cash prize, trophy, medal and Player of the Year ranking points. Through Day One some familiar APAT names were amongst the chip leaders including former champion Rich Offless, On Live winner Michael Patterson (MickeyP) and James Edwards (The Thinker). Chip Leader for much of the day was Liv Boeree, helped by finding AA versus her opponent's Kings. Other players moving to the head of the field after the dinner break were Andy Price, handsomely paid with trip tens by a missed flush draw that had pushed on the flop, Jason Taylor and Steve Harrison. My exit hand which was also my first hand on my new table was Kings v Ace Queen offsuit. Blinds are 200/400 I raised in early position to 1400 and was re-raised to 5400 and once action got to myself I instantly pushed all in for 10300 chips with my kings to be called by loose aggressive person with ace queen. The annoying thing is that the ace never landed but 2 queens did and a king was my only help which never landed, so I exited just 5 minutes before the dinner break. I don't think getting a rub down helped and so I found solice in 2 bottles of champagne shared with fellow APAT'er GMAC. Several key hands were to frame the latter part of the first day's play. Paul Sloggett from Bristol who was on my first starting table out-drew Keith Thomas's Queens with his Pocket eights in a 70,000 chip pot. James Edwards' pair of Queens hit trips on the turn to beat Suraj Shah's Aces and then Liv Boeree found a pair of Kings on the last level of the night in response to two all-ins in front of her. The Kings held to propel her to the head of proceedings as the day finished. Meanwhile consistent throughout the day were Jeldon Fernandes, Darren Starnes and Matt Fowler to be comfortably placed. Blinds began the final table at 6,000-12,000 so the choice for the majority of finalists was stark: they simply had to make quick progress to be in contention for the final. First to depart was David Potter, calling all-in with Ace-Queen having been limp re-raised all in by chip leader Tim Magnus, with Kings. The kings hit a set on the flop to put Magnus in a dominant position in the tournament with approaching half the chips in play eight handed. Magnus then struck again, flopping four to the nut flush and two overcards with AQ of spades which hit on the turn to knock out Steve Harrison who had pushed with second pair on the flop to depart in eighth. In seventh Liv Boeree had become short and her A6 was beaten by Simon Auckland's A9, for Liv to go in seventh. Six handed Tim Magnus had yet to put a foot wrong with three times as many chips as his nearest pursuer Fernandes. Sam Morris was then knocked out by John Murray, hitting a full house on the turn. Jeldon Fernandes then won an all-in race with pocket sevens against King ten suited to knock John Murray out in 5th and close the gap on Magnus. Four handed Magnus had 800,000 and Fernandes 600,000 followed by Sloggett with 450,000 and Auckland 150,000. In a key pot then Sloggett turned two pair to out draw Auckland's slowplayed flopped two pair to double up and felt Auckland who departed in 4th, failing to outdraw Tim Magnus' AK with QJ suited. So, into the medal positions with Magnus leading the way ahead of Sloggett and Fernandes. Eventually an inevitable confrontation occurred, Fernandes with Ace King and Magnus Queens. All-in pre-flop Magnus spiked a trip queen, and Fernandes hit two pair but was knocked out in 3rd leaving Sloggett and Magnus heads up for the title, with Magnus having a healthy chip lead. There are tells and there are blatant tells! !